To make the crepes: In a small saucepan, heat the butter over low heat until it melts. Place the flour, eggs, egg yolks, milk, sugar, salt and melted butter in the blender and purée until smooth, about 10 seconds. Add the water and blend again until smooth. You can also mix the ingredients by hand, following the same order. Place the batter in a container, cover and refrigerate for at least half an hour, or up to 12 hours. Once ready to make the crepes, whisk the batter well with a fork or a whisk. Set a crepe pan or 7 1/2- to 8-inch nonstick skillet over medium-high heat for a couple of minutes. Butter the bottom of the pan and ladle about 1/4 cup of batter into it. Instead of working from the center to the sides, tilt the pan and pour the batter over one side and spread it as quickly as possible to the rest of the pan, so that it covers the entire surface. Cook for about 25 seconds, until edges are cooked and begin to dry out and the bottom of the crepe is lightly browned. With a small spatula or fork, lift one edge of the crepe and turn it over quickly with your fingers. Cook the second side for about 15 seconds, or until it has lightly browned. Flip the crepe onto a plate. Repeat with the rest of the batter. After 3 or 4 crepes, you may need to butter the pan again. If it isn’t a nonstick pan, you may need to do it for each one. 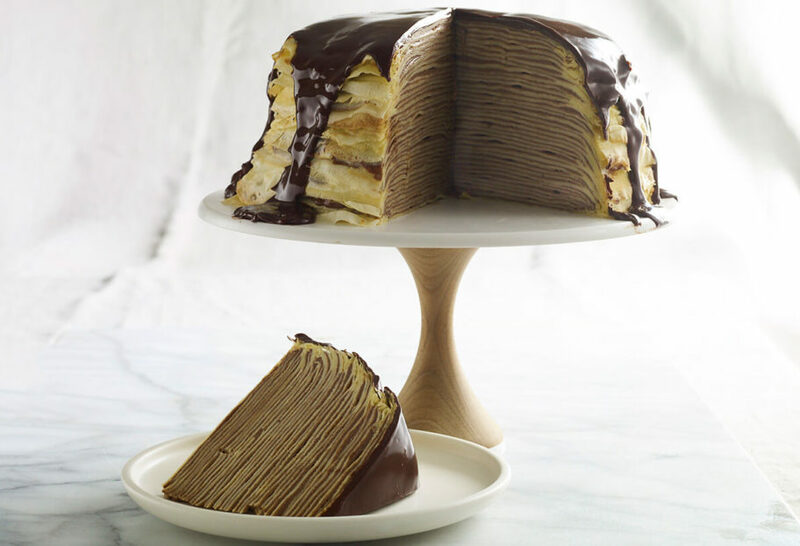 Stack the crepes on top of each other with the first/darker side down. You should have about 35 to 40 crepes. To make the chocolate pastry cream: In a small bowl, mix together the cornstarch and 2/3 cup of the milk. Using your fingers might be easiest. This creates a slurry to prevent lumps in your cream. In a large pot over medium-high heat, bring the remaining milk, cream and 1/2 cup of the sugar to a simmer. In a medium bowl, whisk together the remaining 1/2 cup sugar and the egg yolks. Ladle 1/2 cup of the simmering milk mixture into the eggs, whisking into the eggs while you pour in order to temper the eggs, so they won’t curdle. Once completely combined, pour the egg mixture into the pot with the milk mixture and add your cornstarch slurry. Stirring frequently, cook until mixture is thickened. Remove from the heat, stir in the butter, vanilla and chocolate, until it is all melted and combined. Set aside to cool until ready to use. If it will be more than a few hours, cover with plastic wrap and refrigerate until ready to use. On a cake stand or serving platter, place a crepe and spread or pipe about 3 tablespoons of pastry cream onto the crepe. Repeat until all the crepes and cream are used up. Refrigerate the cake for at least 8 hours or overnight. To make the chocolate ganache (make this after the cake has been refrigerated): Place the chopped chocolate in a large heat-proof bowl. In a small saucepan, bring 1/2 cup cream to a boil. Pour the hot cream over the chocolate. Let it sit for 5 minutes undisturbed, then fold with a rubber spatula until the chocolate and cream are mixed completely. Pour ganache onto the top of the refrigerated cake, letting it drip slightly down the sides. If desired, top with a dusting of confectioners’ sugar and serve with sliced strawberries. Can I refrigerate the tower after pouring ganache on top.? You can, Phyllis. If you are looking to make it ahead for Thanksgiving, you can refrigerate/freeze the crepes for 3-4 days and then assembling the cake. I just saw this episode from your show last weekend! But loving both crepes and chocolate (Being the serious chocoholic that I am), this recipe perhaps stood out the most. Something my mother and I are definitely looking forward to make one of these days! Have fun making it with your mom, Carlos! Mis niños y yo haremos la chocolate 🥞 crepe tower!! How long can this stay in fridge? Can you freeze the crepes ahead of time, then assemble day before party? BTW, record your show so I won’t miss one. You have opened my eyes and kitchen to new recipes. Thank you so much. You can refrigerate/freeze the crepes before assembling the cake for 3-4 days. Have fun making the cake, Kathleen! I CAN HARDLY WAIT TO MAKE THE TOWER, IT LOOKS DELICIOUS. Have fun and enjoy it, Celia! Hi I tried your recipe and thought it was superb.Love your show. 1. About how long does it take (for a non-professional cook) to make the 30-40 crepes? 2. If serving for a dinner party, do you take the cake out of the fridge and let it come to room temperature before topping with ganache, or do you want it still chilled with the ganache goes on? The crepe making process does take some time…but it’s fun 😉 You pour the ganache over the refrigerated cake not at room temp. I hope you enjoy it, Jennifer! Hello Pati! I am am 11 year old boy who wants to play in the NFL and likes to cook. I like your show, and when i saw the crepe tower episode, I was like i have to make that. I am going to try to make it for desert for my family! Yay! I hope you all enjoy it! Thanks patti..Just got done finishing your chocolate crepe tower.will cut into for new years .Thanks for sharing love watching you and juju in the kitchen he is so adorable. HAPPY NEW YEAR. Happy New Year to you too Lori! Patti I want to say thank so much for sharing such a beautiful gift god has give to you.we have a very close gentlemen friend that has cancer and is currently eating out of feeding tube our friend stays home watching your cooking channel we went to visit him and we watched your show before I left he had me ordering your cook book.I am currently making your chocolate tower crepe for him to eat when he is ready for it alot of work but I am so excited to see him eat this.Thank you even my husband got involved helping me make the crepe.God bless.. You have such a beautiful family ..Love watching your little one juju. Sending your friend my warmest wishes, Lori! Email me at hola@patijinich.com and I can send you an autographed bookplate for friend’s new book. Hi patti! THANK YOU SOOOO MUCH. Juju is nothing short of precious, Pati<3 You're truly blessed. Both of you! JuJu we love you here in Michigan.